The Michigan Nature Association is a quiet but near legendary organization, long devoted to establishing "sanctuaries" to preserve the full array of rare species and exemplary habitats across Michigan. 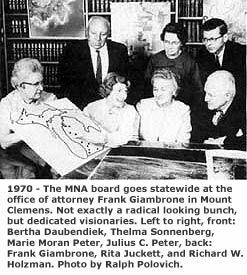 MNA began with a small group of activists whose mission evolved from education, to establishing sanctuaries in a "Ring Around Detroit", to the acquisition of thousands of acres throughout the state. Yet, few have ever heard of MNA, even in its home region of Macomb and Saint Clair Counties. Way back in 1951 a "bird watching group" formed in Macomb County to protest the destruction of State Threatened Common Terns at Metropolitan Beach on Lake Saint Clair. The group persuaded the Huron-Clinton Metropolitan Authority to stop mowing over the tern nests, contrary to the posting of the beach as a State "wildlife sanctuary". In 1952, the group incorporated as the "Saint Clair Metropolitan Beach Sanctuary Association" to maintain a watch on the park. Through the mid-1950s, their focus was nature education, especially for youth in Macomb and Saint Clair Counties. In 1955, they changed their name to the "Macomb Nature Association" and started the Junior Nature Patrol, with 5,000 members by 1957. Despite success, it was apparent that education was not protecting anything. By 1958 they realized the only way to save habitat in rapidly developing southeast Michigan was to buy it. At a time when most people were marveling at post-WWII "progress", the foresight of this group is impressive. In 1959, the Macomb Nature Association sent a "white paper" to every conservation organization in Michigan, describing the need for preservation, but received no response. It was not until 1978 that any organization showed support for MNA, when the Detroit Audubon Society cooperatively purchased land for a sanctuary in Saint Clair County. The Macomb Nature Association made its first land purchase in 1960, "Red Wing Acres Nature Sanctuary" in Lynn Township, Saint Clair County. This was a remnant of the once vast "Capac Swamp", a cranberry marsh with boreal vegetation, and home of the last known native elk in the Thumb, until it was largely drained for agriculture. In 1960 "Red Wing Acres" was still a thriving swamp, but the dredging of Mill Creek in 1965 drained most of it. Subsequent projects included an effort to reduce pollution of Mill Creek, protest of oil drilling in the Port Huron State Game Area which led to a drilling ban in all State Game Areas, acquisition of three more sanctuaries in Saint Clair County, and one in Oakland County. In 1965, they changed their name to "Eastern Michigan Nature Association". But, in 1970, after acquiring 17 sanctuaries across the state, they again changed their name to "Michigan Nature Association" as it has remained since. In that same year MNA began acquiring one of its most well-known sanctuaries, the "Estivant Pines" in the Keweenaw Peninsula, and led a successful campaign for adoption of the Natural Beauty Roads Act of Michigan. In 1974, Bertha Daubendiek, co-founder, guiding force, major benefactor, and Executive Secretary since 1952, was recognized as one of Michigan's top ten volunteers by Governor Milliken. In 1979, Bertha was selected by the Detroit News as "Michiganian of the Year", in only the second year it was awarded. 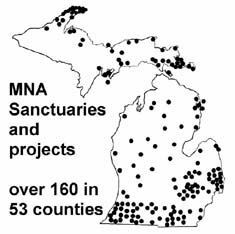 MNA continued to add new sanctuaries throughout Michigan, 50 by 1979, 75 by 1983, and 100 by 1986. In 1984 MNA fulfilled its plan to possess every Michigan native tree species on MNA preserves. While some may think it odd, this was a goal firmly rooted in Bertha Daubendiek's methodical and steadfast ways, for which she is well known. MNA started buying land when the importance of rare species protection was barely recognized. However, when Endangered and Threatened species lists were published by State and federal agencies in the mid-1970s, they revealed that MNA already protected a significant percentage. By the mid-1980s, MNA possessed over 80% of Michigan's native plant species and all but one of the primary habitat types. MNA remains dedicated to the preservation of rare species and unique landscapes across Michigan, now with 160 sanctuaries totaling over 8,000 acres, ranging from the 378-acre "Estivant Pines" in the Keweenaw Peninsula, to the 235-acre "Dowagiac Woods" in Cass County, near the Indiana border. Some are critical of MNAs so-called "postage stamp preserves", considered too small to maintain rare species over the long term. However, they neglect that many MNA sanctuaries are as large as, or larger than other preserves, several being a few hundred acres, and most over 40 acres. While some may not sustain all native fauna, botanical experts consider them quite viable for the rare plants that prompted MNA to buy the land in many cases. And, MNA is not done acquiring land by any means. So, a small parcel today could serve as the foundation for a larger sanctuary tomorrow, whether through MNAs efforts or another group. The Thumb is largely neglected by other groups and agencies, and will continue to be. But, the MNA has 18 sanctuaries here, and their history in our region has instilled a spirit of independence and perseverance to continue filling the gap. For more information about the Michigan Nature Association, visit their web site at www.michigannature.org or contact MNA at 326 East Grand River Avenue, Williamston, Michigan 48895, phone: 517-655-5655, email: michigannature@michigannature.org.